The two Koreas are discussing when and how they will conduct a joint survey on cross-border roads, the Ministry of Unification said Wednesday, with inter-Korean railway inspections already underway. The Koreas plan to inspect the road connecting Goseong in Gangwon Province and Wonsan in the North’s Kangwon Province along the eastern coast of the Korean Peninsula. “Consultations are currently underway, and future schedules will be determined (based on the outcome),” Unification Ministry spokesman Baik Tae-hyun said at a regular press briefing. Officials from both Koreas are exchanging documents, he said, but specific dates for an inspection have not been discussed. In August, the two sides conducted an eight-day study of a road in the western part of the North -- from the border town of Kaesong, North Hwanghae Province, to the capital, Pyongyang. The leaders of the Koreas agreed to modernize and reconnect rail and road systems across the border at an inter-Korean summit on April 27, a move the South believes could accelerate North Korea’s denuclearization. A 23-member team of South Korean officials and engineers returned to Seoul on Wednesday after a six-day joint study on the 400-kilometer Gyeongui Line in the western part of North Korea. 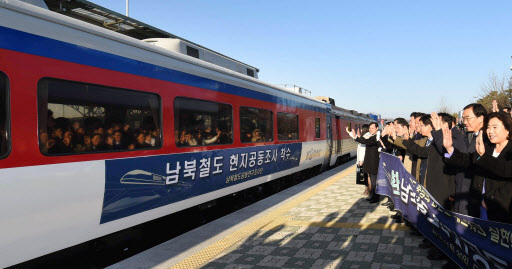 A new team will travel to the North’s eastern coastal city of Wonsan by bus Saturday to inspect the 800-kilometer Donghae Line railway, which runs from Kumgangsan to the Tumen River. The inspection is expected to be completed Dec. 17. The officials will live and work on the train, which has compartments for them to cook and sleep as well as space reserved for fuel, electricity generators and other equipment. The government still plans to hold a groundbreaking ceremony this year for the inter-Korean railway and road connection projects, according to the ministry. Whether the Koreas can link their railways, however, will depend on the progress of the North’s denuclearization, as international sanctions against North Korea prohibit the transfer of oil and other materials as well as investment in the North. The 18-day joint railway study was made possible only after South Korea received a sanctions exemption from the United Nations Security Council with the support of the US.